Waiting to hear how a surgical patient is doing is now easier at Lehigh Valley Hospital–Hazleton. In collaboration with perioperative services at LVHN, a new mobile tool was introduced in June to improve communication with families of surgical patients. This tool – called electronic access to surgical events, or EASE for short – is HIPAA compliant, modernizes hospital communication, reduces family anxiety and improves the patient/family experience. Using a secure smartphone application downloaded from either Apple’s App Store or Google Play, a patient’s family or friends can receive real-time text messages on the status of the patient during surgery. 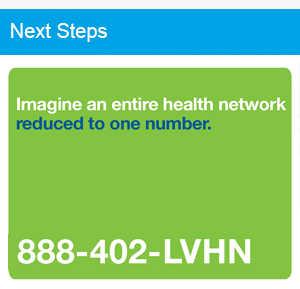 An EASE code is generated and shared by the patient to any number of family members or friends, here or across the country. This significantly reduces family anxiety during long surgical procedures. Messages are deleted one minute after the messages are reviewed. Initially, this technology was piloted at LVH–Hazleton for patients undergoing orthopedic, bariatric and robot-assisted surgeries. Due to the favorable response from patients and families, the program already has been expanded to include any surgeries longer than one hour. Survey data for the period June 6-26, 2018, indicates the EASE application has been well received by patient families.